Approximately 40x enlarged, and modelled in ‘SOMSO-Plast’. 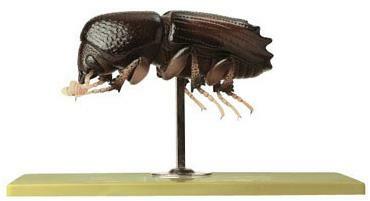 Magnified and true to detail representation of the big Spruce barkbeetle with 8 teeth (Ips typographus). In one piece. On a stand with base. H17 cm, W32 cm, D18 cm, Wt 800 g.